Randye Kaye’s good-natured and popular son was changing. Friends and counselors who attributed Ben’s troublesome behavior to adolescent angst proved to be wrong. He grew distant from his mother and sister and his friends, increasingly confrontational and delusional. He possessed a high IQ, but developed an inflated self-image and know-it-all attitude, dropping out of high school before finishing junior year. His life was spinning out of control. Not until he was in his twenties was his problem diagnosed as schizophrenia. 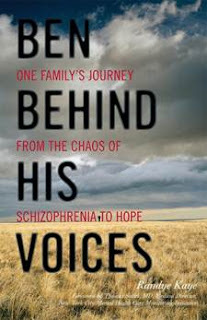 Ben Behind His Voices: One Family’s Journey from the Chaos of Schizophrenia to Hope is Randye Kaye’s gripping story about a single parent raising a schizophrenic son and the anguishing years she spent searching for a solution. Her story shows how her love and determination guided him on the road to recovery. It humanizes the experience of schizophrenia and pays tribute to the courage of anyone who suffers with mental illness and those who choose to help them. Schizophrenia is a common mental illness that afflicts over 2.4 million Americans. It is a disease that often progresses slowly and is difficult to diagnose until someone is in his or her late teens or mid-twenties. By the time the illness takes hold, families are forced to experience and deal with an ever increasing spectrum of unusual behavior and incidents: erratic actions, disappearances, drug use, psychotic episodes, and multiple hospitalizations. It is an illness that can be controlled with careful proper medication but not cured. Today Ben lives semi-independently, attends college, and enjoys being with his friends and family. With remarkable poise and eloquence, Randye Kaye shares what she learned – the importance of educating herself, of continuing to love and support her son, and accepting his condition. She seeks to educate, inspire and help people and families who might have someone suffering from schizophrenia or other mental illness. Her stories are complemented with tips on recognizing warning signs, what to do, what to avoid, how to cope, and where to seek help. My Take on the Bookhat I loved about this book was the honesty and openness that the author shares about her experiences with her son's illness. This story is both inspirational and motivational. The book itself is more than a piece of writing, it is a resource and it is one that is written to allow for anyone effected by this illness to find solace and support in its pages. One of the things that I did enjoy about the book were the stops along the way that the author named Chapter Guideposts. These sections were great as they help the reader to pause and reflect on what they are reading. Also, the book takes the reader through all of the phases of the journey that the author had with her own son and it is this journey that is truly captivating. This book is wonderfully written and keeps the reader engaged from page one. My thanks to the author for sharing her son and her family's story!